Pahrump Valley High School softball coach Cassondra Lauver knew her team would have little trouble once Sunset League play began. Horace Langford Jr./Pahrump Valley Times Jackie Stobbe is greeted by teammates at home plate after belting a home run Monday during Pahrump Valley's 28-5 rout of Valley at Floyd Field in Pahrump. Charlotte Uyeno/Pahrump Valley Times Pahrump Valley senior Joey Koenig singles during Monday's game against Valley. Koenig went 2-for-4 Wednesday during the Trojans' 6-4 loss to Del Sol in Las Vegas. Charlotte Uyeno/Pahrump Valley Times Pahrump Valley senior Tyler Floyd lays down a successful bunt Monday during the Trojans' 11-1 victory over Valley. Floyd singled and scored in the sixth inning Wednesday to pull the Trojans into a 4-4 tie in a game they would lose 6-4. After all, the Trojans had gone 10-0 in the league each of the past two seasons, winning all 20 games via the mercy rule. Judging by the first three league games this season, the league is no closer to offering up any real competition. 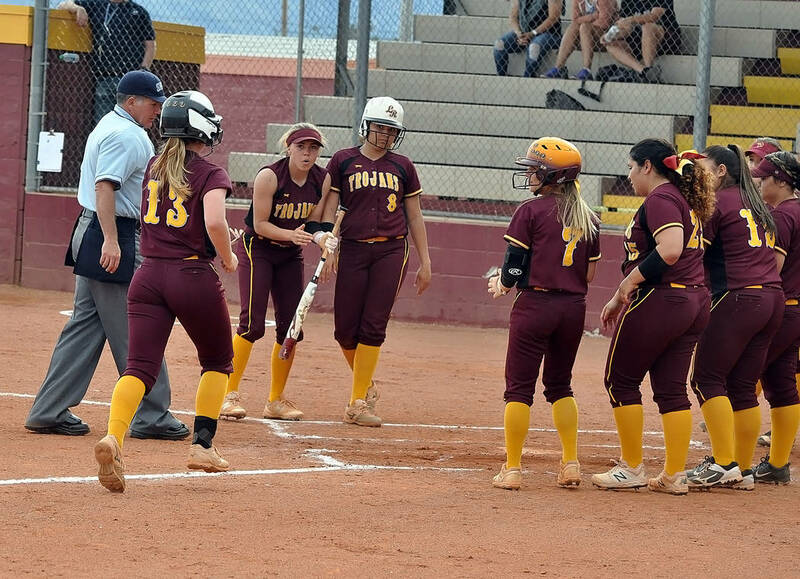 The latest evidence came Wednesday, as Kareena Nelson went 3-for-4 with a double, a triple and 6 RBIs to pace Pahrump Valley to a 21-1 four-inning rout of Del Sol in Las Vegas. A 12-run first inning made the rest of the game pretty much academic, leaving the Trojans (14-6, 3-0 Sunset) looking for ways to find meaning in yet another game against a hopelessly overmatched opponent. “I think we’re continually finding things we need to improve on as a team, and I think individually our players are really looking into what they need to do to be a better athlete at their positions,” Lauver said. Ally Rily continued her strong pitching, allowing 2 hits and no walks over four innings. “Ally and Hannah (Cuellar) I think have been the top two pitchers, but we have some girls in our back pocket that are working hard, too, and they’ve experienced success as well and have pitched well in the opportunities they’ve gotten,” Lauver said. Nicky Velazquez had a big day at the plate against the Dragons (2-11, 1-2 Sunset), belting a triple and a home run while driving in three runs. And it’s not like the Trojans get a lot of good pitches to hit in some of their games. The Trojans have scored 10 runs or more 10 times in 20 games and have outscored Sunset League opponents by an astounding 65-6. Lauver said that if there is one concern, it’s defense. 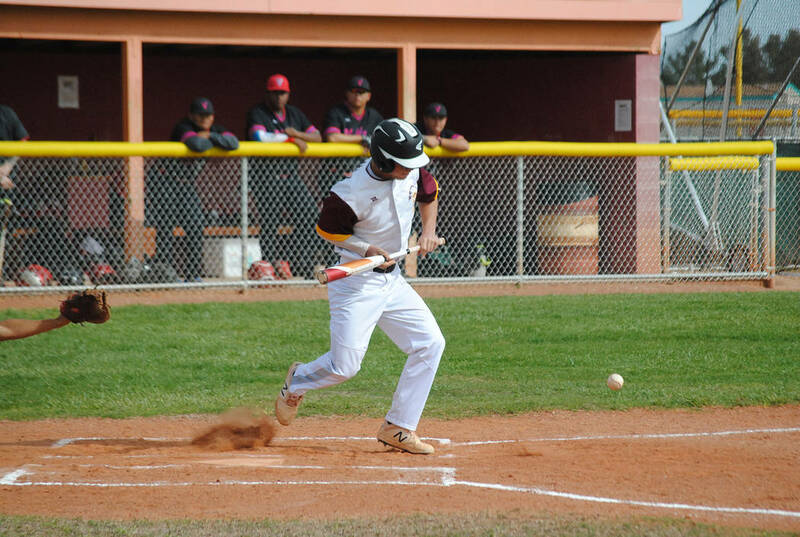 The Trojans made three errors in four innings against Del Sol. “I don’t know that that’s killing us, but it’s something we’re concerned about,” she said. But with the pitching and hitting in midseason form, Lauver remains as optimistic as ever. “Overall I think this group of girls has what it takes to be state champions,” she said. While the softball team was rolling to another routine rout, the baseball team was taking a tough loss. 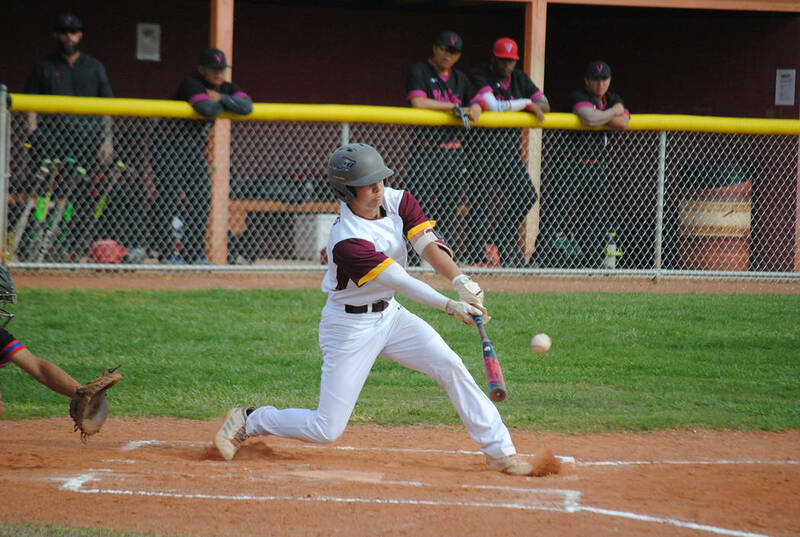 Despite 12 hits, 4 walks and a hit batter, the Trojans had trouble cashing in on opportunities all game and wound up on the short end of a 6-4 score at Del Sol. Trailing 4-0 in the third, the Trojans (9-5, 2-1 Sunset) began to chip away. Jalen Denton singled and scored on a grounder by Willie Lucas, and Chase McDaniel walked, stole second and scored on a one-out triple by Zach Trieb in the third. But Trieb was left stranded and the score remained 4-2. McDaniel singled and stole second in the fifth and scored on a double into the corner in left by Lucas to trim the lead to one, but with two on and one out, a runner was caught breaking for second too early on a steal attempt and was thrown out at second by pitcher Javier Marti. The Trojans tied the game in the sixth when, after getting a runner thrown out at third trying to tag up on a fly ball, Tyler Floyd and Joey Koenig singled and Denton hit a grounder that evaded Del Sol’s second baseman. Floyd scored, but Koenig was thrown out on a bang-bang play at the plate, the fourth time the Trojans had a runner thrown out on the basepaths. Finally tied, the Trojans promptly imploded in the bottom of the sixth, with three infield errors helping the Dragons (6-8, 2-1 Sunset) score twice. Not surprisingly, the Trojans loaded the bases in the top of the seventh — McDaniel, Trieb and Millette each reaching base for the third time — but a fly ball to center ended the game. Havel struck out eight and walked two during a 100-pitch effort, and three of Del Sol’s runs were unearned, including both against Koenig in relief, as the Trojans committed 6 errors. The Trojans will try to get back on track today when the baseball and softball teams host Mojave at 4 p.m.